It should come as no surprise that C.J. Walker, a 6’8 junior from Orlando Christian Prep, was one of the top performers on Sunday. With the ability to grab rebounds and go the distance for scores, he puts enormous pressure on the defense to try to contain him in the open court. A very quick leaper, Walker is able to rise up and dunk in traffic once he catches the ball near the rim before the defense can respond. His ball-handling and scoring skills along the perimeter continue to improve. This is a big spring and summer for Walker and he looks ready to make the most of it. Diante Smith, a 6’6 junior wing out of Choctawhatchee, stayed over after leading his team to the Class 7A title game. A skilled player, Smith is quite the passer out on the perimeter and when handling the basketball in transition. He also is a fairly consistent shooter out to the three point line. Smith is a good athlete that aggressively pursues rebounds at both ends of the floor. With his length and lateral quickness, he can defend multiple positions if necessary. Another player out of Orlando Christian Prep, 6’9 junior Kai Jones, continues to make an impression here in the state. A native of the Bahamas, Jones has been state-side a little less than a year but has quickly gotten college coaches buzzing. A bit on the thin side, he is a lengthy rim runner in transition and a stalwart rim defender. We’ve seen him score facing the basket on more than one occasion but on Sunday he was mostly limited to paint touches, which he finished off with little difficulty. While he’s more prospect than player at this point, Jones has a high ceiling and will contribute sooner rather than later at the next level. A 6’7 senior small forward out of Hialeah Mater Academy, Jesus Duquesne could be an attractive commodity in the late signing period. He runs the floor, finishes strong at the basket and is a solid rebounder. While his shot didn’t fall from the perimeter on Sunday, Duquesne does have good form and release so the fundamentals are there. Defensively he is active and covers a lot of ground quickly. Whenever Niven Glover steps on the court, anticipation and excitement follow. The 6’4 junior out of Orlando Oakridge is a high flyer that puts down dunks with the best of them. To his credit, he is becoming more of an overall basketball player than mixtape performer. Glover ball-handling and perimeter shooting have improved and he is starting to get the fact that he can use his physical gifts at the defensive end to create scores. It will be interesting to see how his game is received by college coaches come the live periods in April and July. A junior out of Lake Nona just outside of Orlando, 6’3 Tyler Rodrigue caught our attention in an afternoon contest. A smart shooter than plays within his abilities, he didn’t get caught up in the chaotic atmosphere that sometimes accompanies these events. Rodrigue knocked down a couple of open looks from the perimeter and then used that to get to the basket and score when the defense over-played him. Also of note was his ability to come out of the scrum with offensive rebounds against bigger players. Punta Gorda Charotte’s 6’3 junior Ahmad Johnson had himself a pair of solid outings on Sunday. A physical guard, he does a solid job of getting to the rim and finishing in traffic. He also found ways to slither into the paint for offensive rebounds and putbacks. Defensively, he’s rangy and covers a lot of territory quickly. Johnson is also a solid ball-handler and passer out along the perimeter. One of the bigger surprises on Sunday was the play of Vadim Clanet, a 6’8 junior out of Warner Christian Academy. Active at both ends, he rebounded well, ran the floor, seemed to get to every 50/50 ball and showed a good touch around the basket. Clanet made some tough shots in traffic and raised some eyebrows with a deft backdoor pass for an assist. He missed the lone perimeter shot we say him take but the mechanics looked solid. It’s doubtful he will be a sleeper much longer. 6’7 senior Tyrese Williams of Oldsmar Christian was one of the more entertaining players on Sunday. An excellent run/jump athlete, he is able to finish above the rim regardless of the pace of play. A quick riser, he is a sneaky offensive rebounder that often gets to the ball before bigger players that are closer to the basket. Williams has the ability to score well from inside the three point line, whether it be on drives to the rim or jump shots. There was quite a bit of talent on Team 10 but ultimately the best performer for the team was Providence’s 6’6 junior Ahren Freeman. Strong and skilled, he plays bigger than his size. He has a high basketball IQ, is a solid passer, finishes thru contact at the rim and knocks down open shots along the perimeter. Freeman is also quick to push the ball up the floor, via either the dribble or the pass, once he secures a rebound or a steal. Some may look at him and say “tweener” but he’s got the skills and savvy to play a lot of different positions. Johnnie Williams IV, a 6’4 junior from Sarasota Booker, didn’t seem to let the one point loss in the state semi-final nag at him for too long. A strong and athletic wing, he scored the ball well off the catch from beyond the arc and was also able to score thru contact in transition. He made one spectacular play on the defensive end when he literally grabbed the ball out of the opponent’s hands in mid-air while attempting a shot. 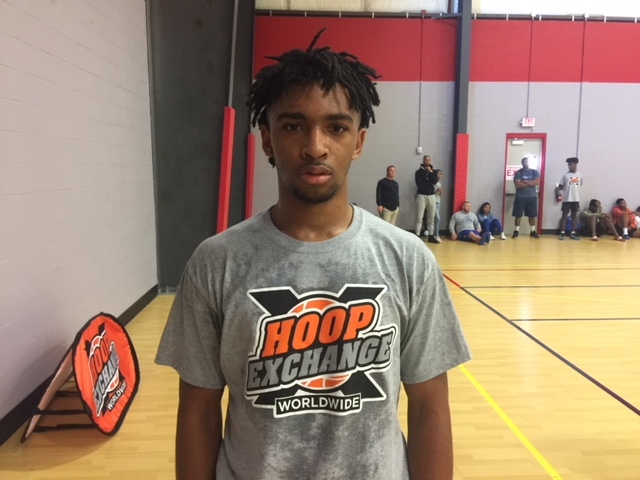 Williams is definitely a candidate to “blow up” this coming April during the live period. The final game of the day at this type of event is usually not the prettiest of sites. Still, we held out hope to see someone worthwhile and that proved to be Reggie Duhart, a 6’8 junior from Delray Beach Atlantic. He also all the physical tools in terms of size, wing span, and leaping ability. Duhart is fast up and down the floor in transition, is quick to outlet the ball once the defensive rebound is secured, and covers a lot of area quickly on the defensive end. Whether he can create his own offense has yet to be determined but Duhart appears to be a prospect with great promise.